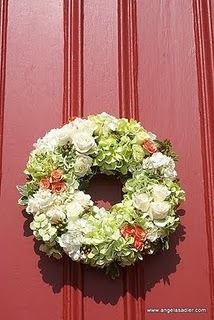 So tomorrow I am meeting up with my florist at the wholesale flower market in Nashville. I think we will be able to knock out what I want pretty quickly. These are photos of flowers that my florist Angela Sadler did of a wedding in my chapel. It's nice that's she's familiar with the unfamiliar venue! 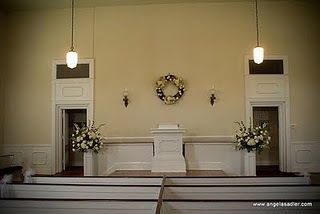 Look how cute and antique-y the chapel is! It's got lace curtains on it's almost floor to ceiling windows! Love it! The best part? It's only $250. Sa-weet! As you all know, I went to town on bud vases from Crate & Barrel, a few from Target as well as a few from Ikea - thrown in for good measure. Those will be for the tables. That's what we really need to figure out. Other than that, we've just got to decide on the bouquets (easy), boutonnieres, corsages and flower girl headpiece. Angela told me that a "no" list can be just as good as a "want" list! 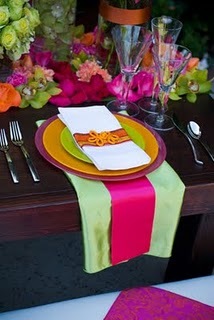 I was browsing Google Reader this morning and saw an AWESOME idea on Elizabeth Anne Designs. How freaking cute is this? 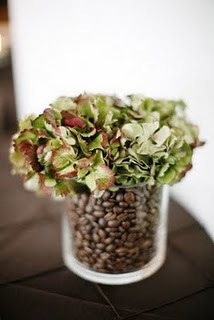 What if I put coffee beans in the little bud vases with a stem or two of ivory colored flowers that are yet to be determined? 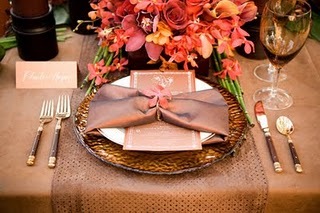 Can you see them on the tables with the ivory linens and chocolate brown chargers? Or is it too much? Maybe simple is better. I'm bringing some of the bud vases with me tomorrow. Maybe I should grab a small bag of coffee beans to take with me to see how it looks! Angela is going to think I'm freakin' nuts. Feedback from The Blog-o-Sphere is appreciated. As always. 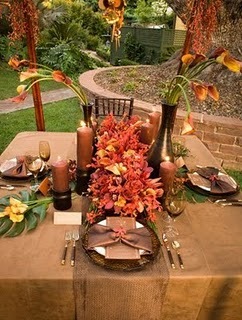 I think I'm going to start with table settings. The vision in my head is one of casual elegance. Simple and elegant. Nothing over the top, but simple things pulled together well. This is actually part of my daily job as a product developer, but it's so much harder when it's for myself. I mean, I'm about to drop close to 3 million dollars on my 2010 line and I don't blink. However, I can sit and ponder my glass bud vases for hours and still not be sure! So here's where we're at. As you already know, I ordered my bud vases from Crate & Barrel as they were massively on sale. I also got some $.99 bud vases from Target and $.79 bud vases from Ikea. Here's all the glassware I have. Hopefully, it will be plenty. The Candyman was not clear on why I needed to unpack it all, just to pack it back up again. However, I'm highly visual and just needed to SEE it. So when I was overseas, I got together with one of my Indian vendors and ordered chargers and cake plates from some open stock he had on hand and I just chose a finish for him to work with. The chargers and cake plates came in last week. Here's what they look like. Hello to 80 chargers! I actually had ordered 90, but he sent me 80. Hm. Can't look a major-deal-gift-horse in the mouth, so I'm just going to cross my fingers and hope that it's enough! And then I ordered 4 large cake plates for our cake buffet. As of last week, I also ordered another small, 6" cake for the one we will cut. That has it's own smaller cake stand in the same finish (I just don't have a really good pic of it). We won't use the glass domes because they are too small for the heights of our cakes. 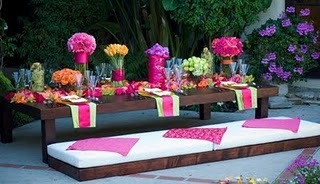 So the tables will have the sandalwood and ivory linens, the chocolate brown chargers with ivory napkins on top. We're going to tuck the menu in the napkin (it's ivory with brown trim) and place the chocolate brown/ivory boxed favors on top of the napkin. The centerpieces will be a variety of glass bud vases with a variety of ivory colored flowers (meeting with the florist this weekend!) and votives. I hope it all comes together! I'm getting pretty excited! Wildflowers Ain't Just for Bouquets! I love me some GetMarried.com. I really do. Today they were talking about tablescapes and Chivari chairs and all the fancy stuff that just isn't going to be happening at my wedding! 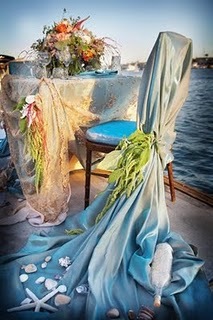 The article linked up to a fabulous linen rental company called Wildflower Linen. Holy cow! Amazing stuff! They have a blog too! Love the little frog closures! My personal favorite. If money weren't an object, I'd go for this setting. I'm going to try to get close though! I've got some chargers coming in from India that I ordered when I was overseas. I hope they will help create a pretty setting. While not a drop-dead gorgeous as this, it will be my own version of fabulousity! You have got to check this website out if you aren't familiar already. LOTS of ideas just came flooding in! I swear, the closer I get to my wedding, the less I should read. I keep getting all these "extra" ideas that are just exhausting me. Sadly, I'm hooked. Is there some sort of methadone clinic for wedding addictions? I need an intervention! 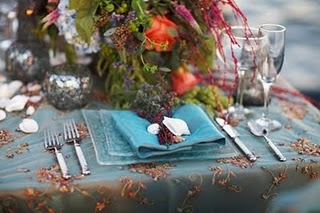 What's your dream tablescape? Do you have one? Are you winging it?